D063821 (the appeal of the Jan. 29, 2013 Default Judgment and other issues). attempt to subvert the judicial process and to deny Appellant equal protection of the law. 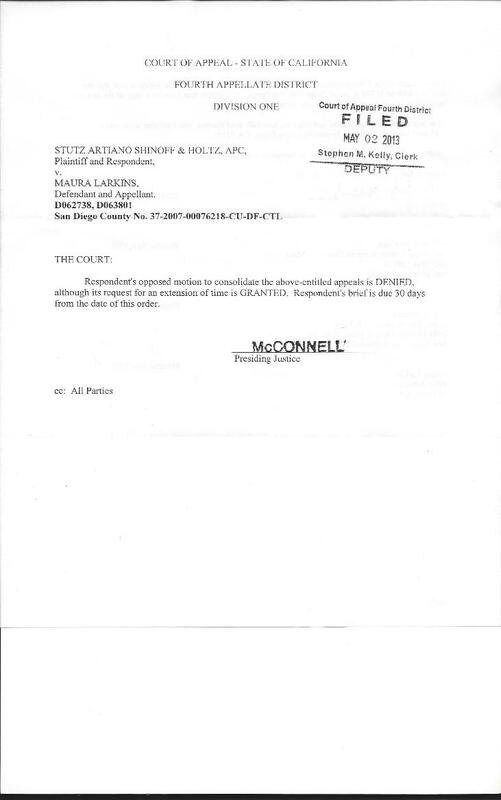 INSURANCE], beginning today February 27, 2013, before the Honorable Judge Steven R.
Denton in Department C-73 of the San Diego Superior Court's Central Division." to prepare a response than it admits. with additional issues before it files a single response in this case. s motive is to avoid the embarrassment of another loss in the Court of Appeal. appellant's opening brief, and any oral argument by the appellant. appeal of the Default Judgment and other issues) be denied. Opening Brief and Reply for each appeal as she is entitled by law.